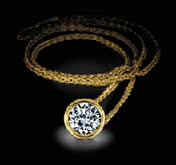 Pendants: Always a valued and much appreciated gift, the pendant is a much admired piece of jewelry. Browse some of the designs shown or call us at (800)232-9446 to discuss a custom design. 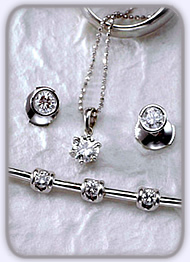 All shapes and sizes of diamonds are suitable for mounting as a pendant. Choose from beautiful gold chains such as cobra, snake or anchor. Bracelets and earstuds: Both the bracelet and earstuds are classic gifts and expressions of love from one to another. Our tennis bracelets are available in 7” straight line or other designs to order. We use quality US or Italian made bracelet blanks which are superior to most others. Earstuds are available in just about any size and quality which means that the price range is vast. We’ll be glad to hear from you and quote you on a specific size/quality combination. We use quality 14 karat yellow or white gold earring mountings of different styles. 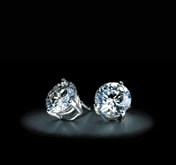 These are durable and set off the diamonds very well. Appraisal: Each piece purchased from us is accompanied by an appraisal specifying the quality of the diamond/s, the gold or platinum used and lists a value for insurance purposes. In the case of a diamond which is graded by one of the known gem laboratories, the stone will be accompanied by its certificate.